1) Bridal Gowns – What you will see in 2012 are more flirty, high fashion dresses that are shorter in length, also gowns with layers of texture and (finally) a little something on top. Inspired by Kate Middleton, designers have incorporated sheer laces and illusion on top to offer brides an alternative to strapless. 2) A great way to add interest to an otherwise simple gown is with an embellished belt. Look for these belts to explode in 2012. 3) Feathers continue to be the most popular accent for shoes, bouquets and hair. Peacock and ostrich top the list. 4) For 2012 you will see couples continue to take a more active part in the ceremony rather than simply standing at the altar, repeating the words that someone else has written. Writing your own vows is meaningful, personal and helps the couple to express their love for one another in their own unique way without hesitation. 5) Couples are opting for smaller, more intimate affairs with 100 of their closest friends rather than 1,000 people who they may not know very well. Spending less per head allows couples to have a celebration that is more lavish and yet controlled, it’s quality versus quantity. 6) Standard wedding videos are out, movies are in. Imagine if you could have Steven Spielberg edit your video footage into a ten minute movie with a plot, climax and happy ending! You can still keep all the footage but, you will have a mini-masterpiece to share with your family and friends that won’t put them to sleep or bore them to tears. Find the right videographer and this dream can be your reality. 7) High-profile event planner Bryan Rafanelli says party favors and accessories are becoming more and more customized to the individual couples to reflect their interests and tastes. For the music lover, using cleft note place-card holders and musical note candle as gifts will tie everything together. 8) The vintage trend continues as couples embrace the look and feel of antique table settings, flowers and attire. Old Hollywood, Victorian Vintage, and 1940’s Big Band themes are a popular and all have a comfortable, relaxed charm. 9) Color is everywhere. For those brides who find picking a particular color a daunting task, rest easy – the current trend is multiple colors. Color can be the only theme you need if you find the right combination; dusty rose and silver for a vintage feel or turquoise and purple for a more modern look. Either way, color can leave a lasting impression and create impact. 10) Grooms have more choices than ever with tuxedos but nothing will ever beat a classic notched-lapel tuxedo with a bow tie. For men who want to shake it up a bit, experiment with studs that express your personality or try a classic white bow tie and vest. Planning your dream wedding is easier than ever. Call 847-428-3320 to get tickets to a Bridal Expo Luxury Event so you can experience all of the most exciting trends in bridal attire and wedding planning. There are many ways to express your love for your betrothed…. 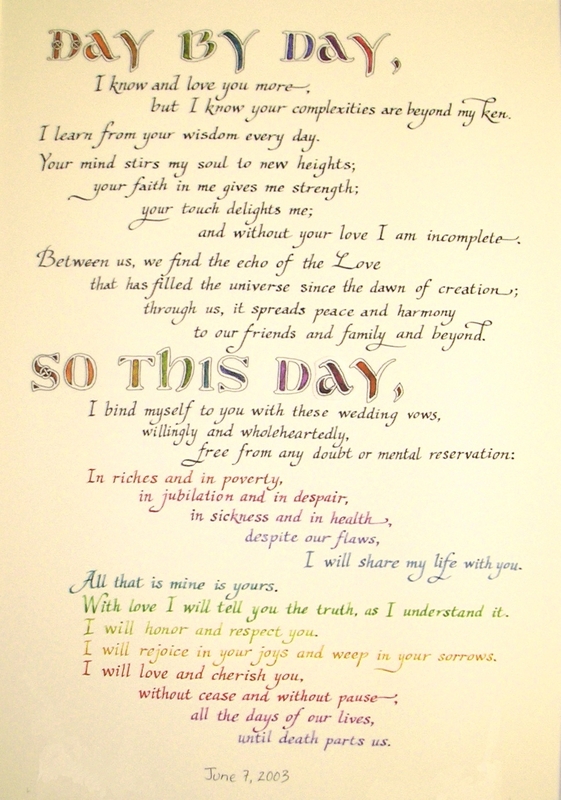 but for many, nothing compares to writing your own wedding vows. It is singlhandedly one of the most romantic forms of expression and commitment you will ever have the opportunity to share with your loved one. Unfortunately is it also one of the hardest for some. Let’s face it, we are not all poets or writers, we are not all blessed with the ability to express our feelings in public and we are not all capable of turning thoughts and feelings into words. In fact, some people would rather have their hair set on fire than have to speak in front of a crowd. Rather than let this become a problem for the one partner who is able to clearly articulate their feelings, there are many solutions to reciting your own personalized wedding vows. First and foremost, this should be done together. I know in movies the couple write their own vows separately and then surprise!.. they recite them flawlessly and without hesitation. This is not a movie and neither of you are trained actors. Writing your vows together is important for several reasons. You will share the same tone, the same general theme and you will be there to support one another while writing and then later while reciting the vows. Decide on an overall theme. Are you deeply religious or deeply committed to the environment? Do you have children together or blending a family together? Use that as a starting point and move forward. Each of you can make points about how you feel the other person enables you to be more committed to this topic or how the other person drew you into it. Decide on the delivery. Will you be adding a humourous touch to the vows? “I promise to love, honor and always put up the toilet seat” may sound silly but, in all fairness married couples fight about silly things sometimes. Making a marriage commitment means you are commited to working through all of these ridiculous habits and still be able to laugh with this person at the end of the day. It means you are willing to accept their habits and marry them. The bonus is that you can always bring this up later. “Remember, in our vows you said you promised to put up the toilet seat.” I’m kidding, of course but, not really. Don’t get to personal. Leave out anything that might raise eyebrows. Extremely personal information is completely off-limits and frankly I can’t imagine why anyone would want to share this with an entire congregation of family and friends but, trust me – they do. Keep it Simple. If your vows last longer than one or two minutes ( at the very most), you might as well be reading War & Peace out loud. Your guests don’t want or need an autobiographical account of your entire lives – save something to talk about at the reception. Practice, practice, practice. After your vows are written, practice them several times out loud in front of a mirror. You don’t need to do this together, just make sure both of you do it. This will help if you have some amount of fear of public speaking and will also give you time to see how it sounds loud. You may want to substitute a difficult word after hearing how it sounds. If one of you is uncomfortable writing your own vows, consider adapting the standard vows (the term ‘obey’ comes to mind). When you do make changes, remember: you are not vowing to ‘try to’ uphold the vows, you are making a solemn pledge to actually uphold the vows. You are not ‘trying‘ to remain faithful or honest for eternity, you are making a pledge that you will do just that. Words like “I will try to remain faithful” are as meaningless as “I will try to take out the garbage”… trust me , it probably won’t happen. Some churches do not allow changes or modifications to the standard marriage vows and some do not allow couples to write their own vows. You will need to check with your officiant before even considering this as an option. If you decide to write your own vows, think before you speak and remember what you are there to do: commit to a monogamous relationship to the other person…from this day forward, ’til death do you part.